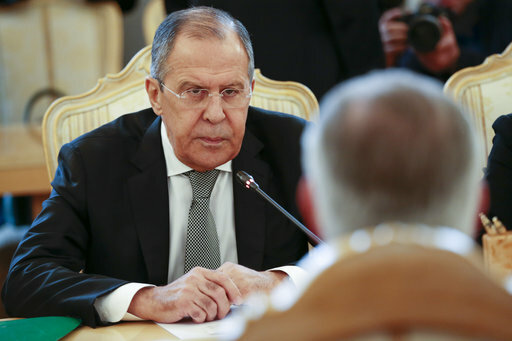 MOSCOW (AP) — Russia’s top diplomat accused the United States on Wednesday of carrying out an unlawful attack against Syrian President Bashar Assad’s forces as he opened a fraught meeting with visiting U.S. Secretary of State Rex Tillerson. It was an ominous start to Tillerson’s visit — the first to Russia by a Trump Cabinet official. Tillerson conceded the two world powers had “sharp differences” that have obstructed cooperation but voiced optimism that their talks could narrow those differences. Trump, meanwhile, told Fox Business News that the U.S. had no plans to become more deeply involved in Syria and only did so because of last week’s deadly chemical weapons attack that killed dozens. Turkey has said tests showed sarin gas was used. Only weeks ago, it appeared that Trump, who lavishly praised Russian President Vladimir Putin throughout the campaign, was poised for a potentially historic rapprochement with Russia. But any expectations of an easy rapport have crashed into reality as the two countries trade escalating accusations over what happened last week in rebel-held territory in northern Syria. Moscow has strenuously objected to Trump’s decision to launch 59 U.S. Tomahawk missiles at a Syrian air base that the U.S. says was used to pummel civilians with nerve gas, resulting in 87 deaths. Russia, Assad’s staunchest ally, has insisted that Assad is blameless and that it was actually the rebels responsible for the disbursed chemical weapons. Associated Press writers Vladimir Isachenkov, Nataliya Vasilyeva and Jim Heintz contributed to this report.